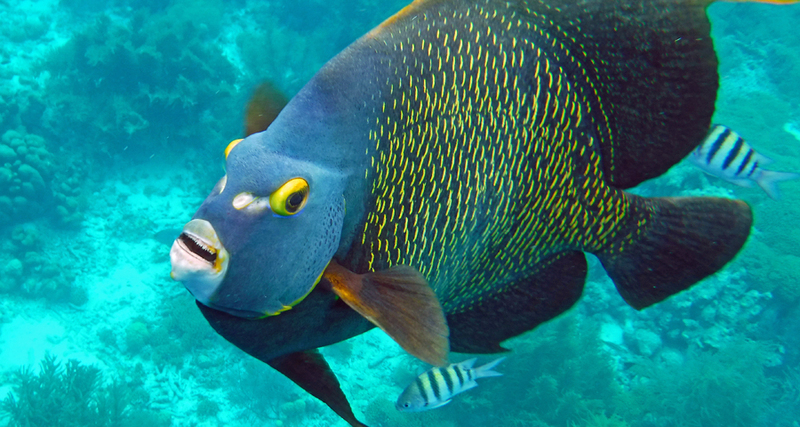 I read this interesting tidbit about parrot fish in a Bonaire travel magazine. Two things occurred to me after reading it. First, I thought, that’s freakin’ amazing and tried to imagine how big is a 200 pound pile of sand. Second, I couldn’t help but think this is probably not the best magazine to feature information of this sort. It’s a tourist magazine. And basically, the tourists have come all the way to Bonaire planning to enjoy basking on white sandy beaches as part of their holiday in paradise. And now, they read this magazine in their hotel room and find out they will be actually be basking in fish poop. The article went on to say the sand on the beach was generated in two ways. 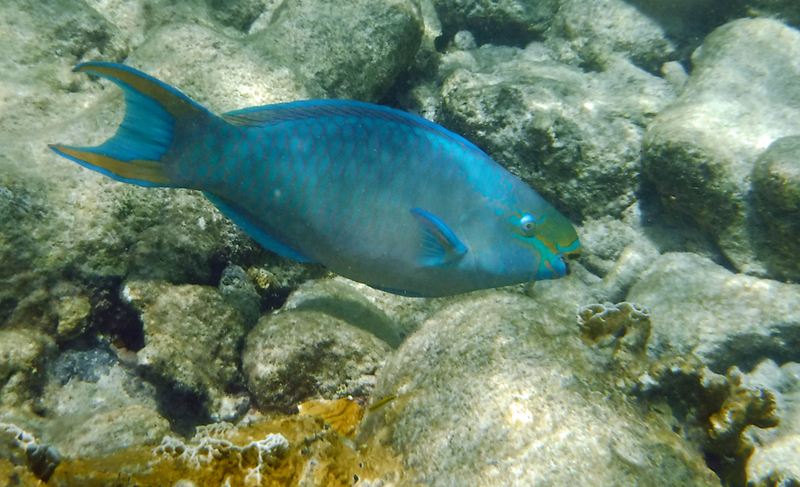 70% of the sand on the beach is created by parrot fish. 30% is created by the natural ocean tidal currents and erosion of rocks. So once again, my brain kicked into gear and I think I might have spotted a business opportunity. Considering the magazine in the room has just educated the tourist how the sand is really fish poop, perhaps it would make sense for resort hotels to put up signs stating the sand on their superb beaches is not really parrot fish poop. They can claim they have refined and sorted the sand grains to only include grains formed by ocean currents. I was going to say natural sand or organic sand, but it occurred to me all sand is organic, even the poop. Well, perhaps the resorts could claim “clean” sand. 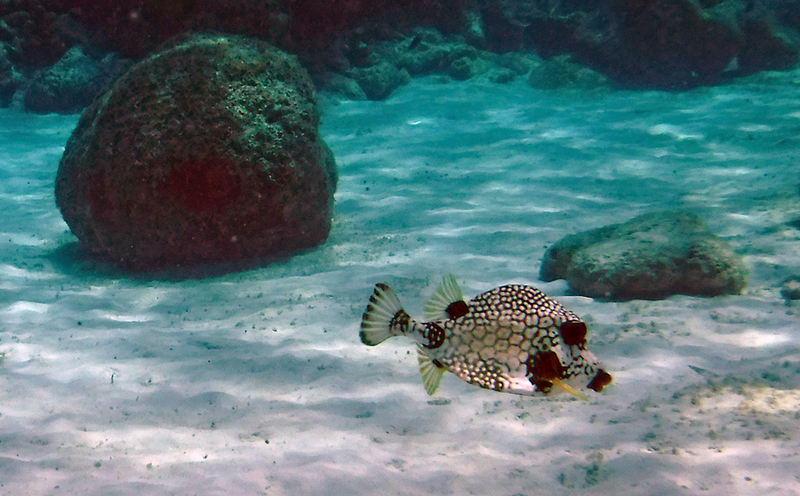 And, identifying the fish poop sand from the other type could create a lot of jobs. Or better still, I could sell them “clean” sand. I am thinking about having my sand made in China. This is where I think I might get the best quality control. This factoid is not just true for Bonaire; it is true for beaches all around the world. Do you remember as a kid dropping your sandwich in the sand on the beach? Do you remember dusting it off a little bit? Do you remember the grittiness as you ate it? It’s amazing you lived, isn’t it? I hope as a reader of this blog you are not a germophobe. I imagine news such as this could send your whole world into a tizzy. I’m really sorry if this is the case. But fear not, convince yourself the sand was sterilized by the sun and you’ll be just fine. When you see the seagull crap onto the sand, just pretend that never happened. You’ll live. 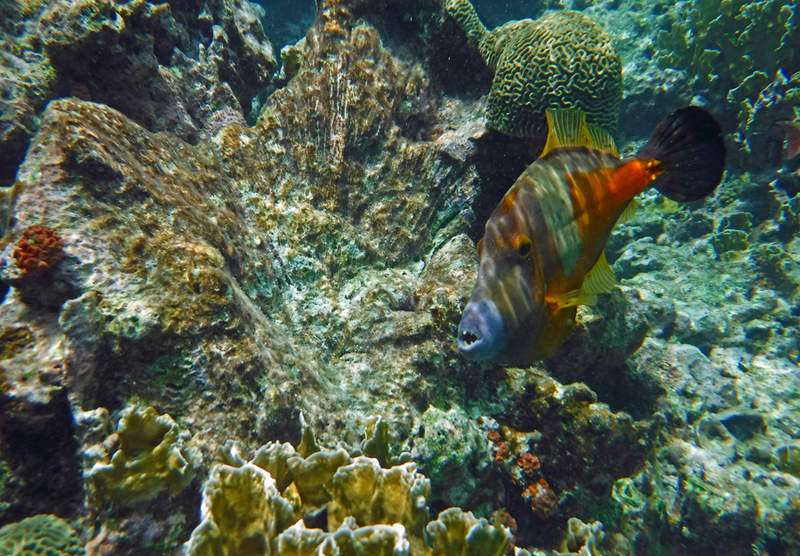 Cindy and I have spent a lot time this week underwater looking at parrot fish, among others. 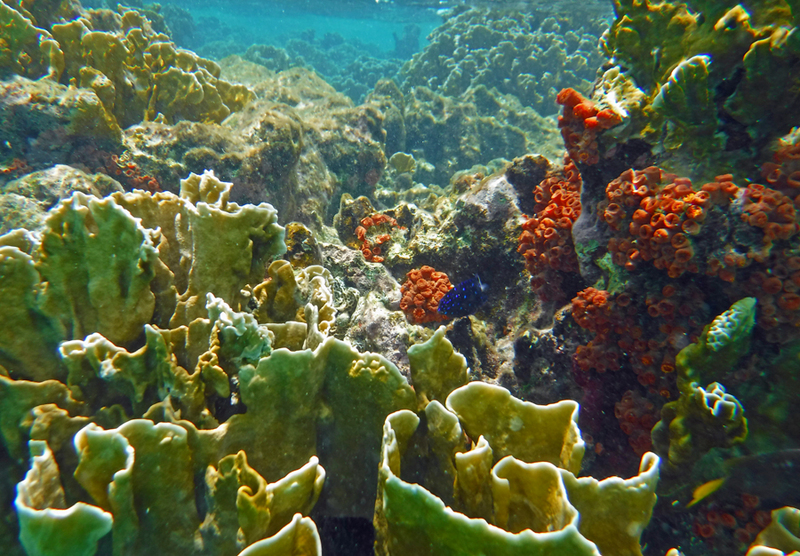 We have been taking our dinghy out to a lot of the snorkel spots around Bonaire. We purchased a map from a local dive shop. The map shows the locations of park provided moorings. No vessel is allowed to drop an anchor in the waters surrounding Bonaire. This is to protect the reefs surrounding the island that provide the incredible diving experience and bring the tourists. They are very serious about this no anchor rule. The fines are hefty. 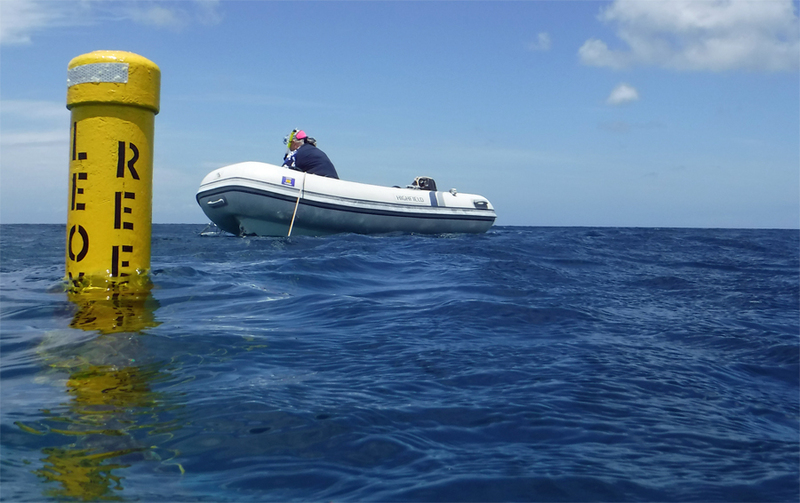 Free moorings are provided and a vessel can occupy a mooring buoy for up to two hours. The buoys are marked with the name of the dive site so you know you are in the right place. If you are in a dinghy, up to three dinghies can tie to a mooring. There are hundreds of moorings to choose from. Our map shows the location of each and gives a brief description of what is under the water. And as an added bit of ingenuity, the map is waterproof so we can take it with us in the dinghy. 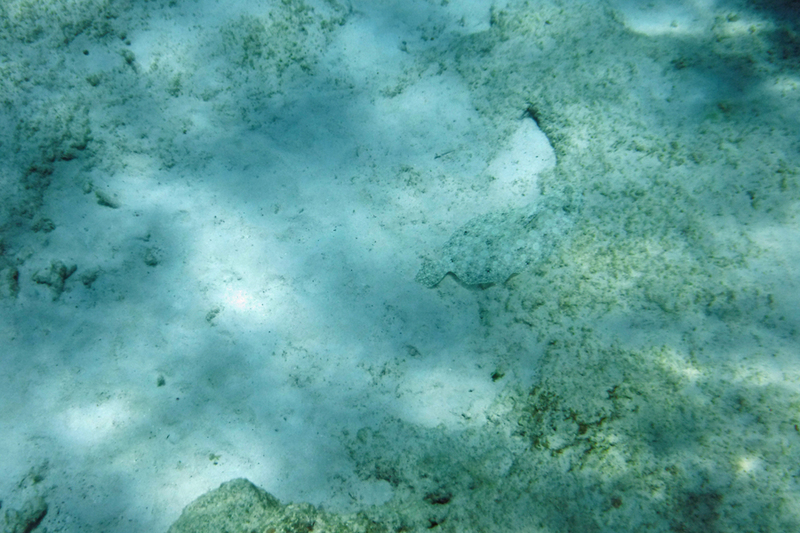 There is a Peacock Flounder in this picture. Can you see it? Our days start with a nice breakfast aboard the Puffster. Then, we pull out the map and start to look at the sites we want to explore. On the days with less wind (notice I didn’t say no wind – it is always windy here), we take the dink across to Klein Bonaire. Klein Bonaire translates from Dutch to Small Bonaire. It is an uninhabited island just to the west of us. The entire island is a national park. The water in this area is absolutely crystal clear and it has become one of our favorite places to snorkel since we started this whole travel adventure. 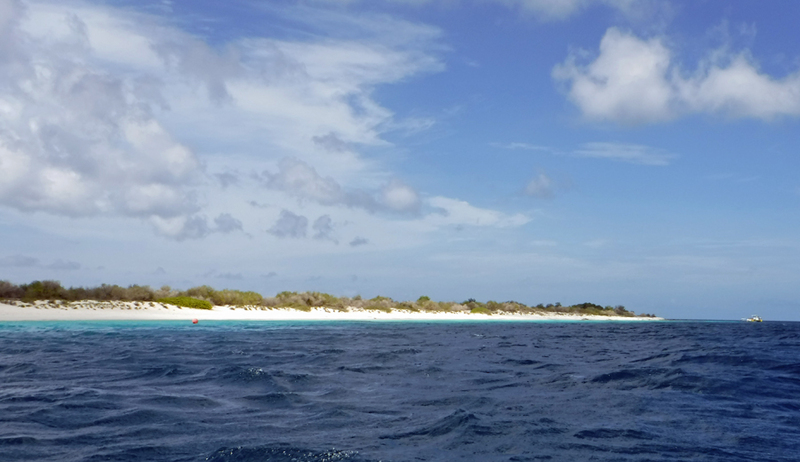 On a windy day, the dinghy ride to Klein Bonaire can be… let’s just say uncomfortable. Well technically speaking, it is not the ride there since the wind is with us going over; it’s the ride back that’s the killer. We are so glad we made the investment into a good dinghy a couple of years ago. Money well spent! 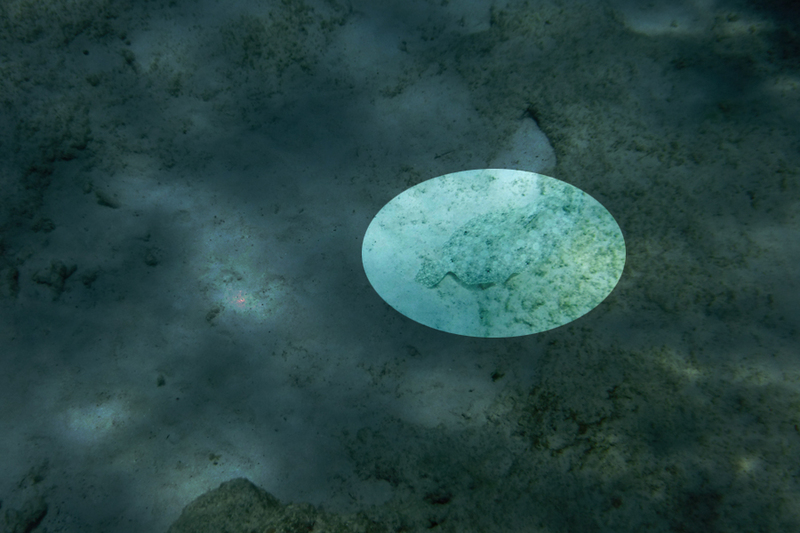 Below is a really short video showing the abundance of underwater sea-life in Bonaire. This was taken just about 20 meters from the shore. 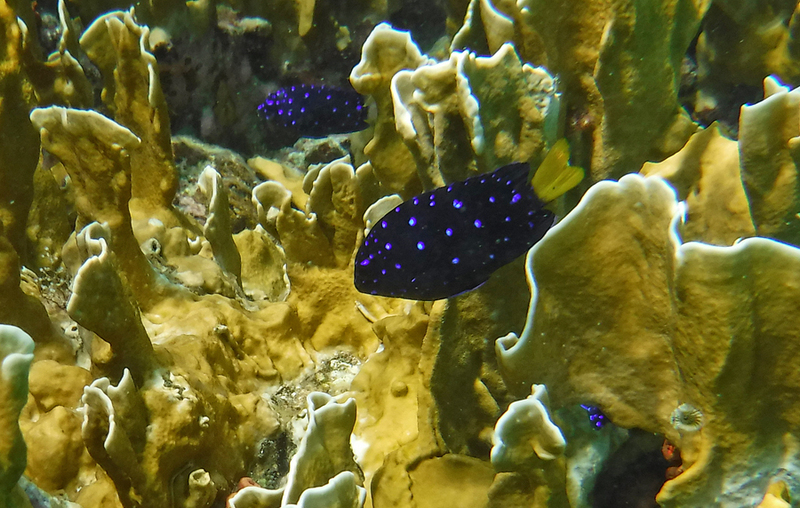 You don’t really need a boat or dive gear in Bonaire to have an awesome underwater experience. Just put your face in the water and take a look. It’s an amazing place to be hanging about this summer. If you don’t see the video click here.